Products may be stamped KUS or Wema. Wema/KUS SSS 8" s ending unit. Products may be stamped KUS or Wema. 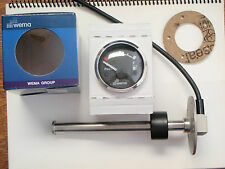 Wema/KUS SSL 14" sending unit. FIVE (5) -10/24 X 3/4" SCREWS. CORK GASKET 2-3/4"OD, 1-1/2"ID. Products may be stamped KUS or Wema. Wema/KUS SSS 7-1/2" sending unit. Trending at $39.99eBay determines this price through a machine learned model of the product's sale prices within the last 90 days. Fluid Level (Water-black water). Transmission Oil Pressure. Engine Oil pressure. Pactrade Marine Boat RV Truck Car KUS SS 316 Fuel Water Level Gauge Sensor 240-33ohms SAE Standard 5 Holes. It is done bu sealed read switches positioned inside the main shaft of the sensor. A float with built-in magnets then triggers the reed switch delay, generating a potential-signal with resistance, current, or voltage value that increases or decreases according to fluid level, then give the signal to the gauge via wires, which shows the right level reading by pointer. this level sensors, the float is the only moving part of the sensor, thereby minimizing potential mechanical failures to get the precision measurement. ---OEM quality, widely used on automotive and marine OEM ---Reed switch, continuous and steady output signal. ---Simple and strong structure. ---Advanced corrosion resistance. GAUGE HAS WHITE BEZEL WITH WHITE FACE, IS LIGHTED, AND REQUIRES STANDARD 2-1/16" MOUNTING HOLE. GAUGE HAS WHITE FACE WITH WHITE BEZEL AND REQUIRES A 2-1/16" MOUNTING HOLE. WATER GAS OR DIESEL FUEL SENDING UNIT LENGTH IS 9", FOR USE WITH MINIMUM 10" TANK DEPTH. SENDER USES STANDARD MOUNT SAE 5 HOLE PATTERN 2.125" (2-1/8") BOLT CIRCLE. LIGHTED GAUGE, BLACK FACE WITH BLACK BEZEL. This gauge features Fuel level, Oil Pressure, Water Temp. Boat Light. Boat Ladder. Boat Fender. Marine Gauge. This gauge display speed in tenth (1/10) under 100 (kmh/mph/knots) for example : 99.8km/h – 101km/h. 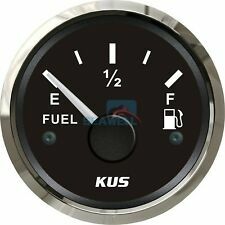 Pactrade Marine Boat RV Truck Car KUS SS 316 Fuel Water Level Gauge Sensor 240-33ohms SAE Standard 5 Holes. It is done bu sealed read switches positioned inside the main shaft of the sensor. A float with built-in magnets then triggers the reed switch delay, generating a potential-signal with resistance, current, or voltage value that increases or decreases according to fluid level, then give the signal to the gauge via wires, which shows the right level reading by pointer. this level sensors, the float is the only moving part of the sensor, thereby minimizing potential mechanical failures to get the precision measurement. 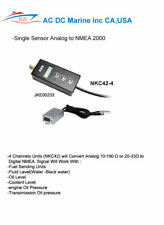 It is a high quality fuel level sender Economical level sensing solutions. Without limitation of environment, length can be customized. Fuel/water SAE 5 hole 316 sender. Wema/KUS sender 10". Products may be stamped KUS or Wema. Wema/KUS SSS 5-1/2" sending unit. Wema S5U 10" sending unit. Products may be stamped KUS or Wema. Wema S5U 23" sending unit. Products may be stamped KUS or Wema. 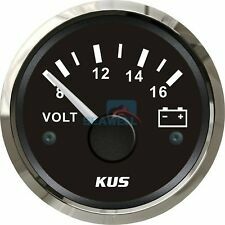 GAUGE HAS BLACK FACE WITH BLACK BEZEL, IS LIGHTED AND REQUIRES STANDARD 2-1/16" MOUNTING HOLE. STANDARD MOUNTS-SAE 5 HOLE PATTERN 2.125" BOLT CIRCLE. 240-30 OHMS. WEMA USA FUEL SENDING UNIT. FOR USE WITH GAS, DIESEL, OR WATER. 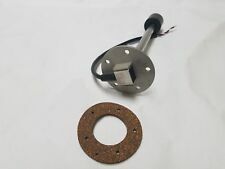 THIS ITEM INCLUDES 7" SENDER AND CORK GASKET. STANDARD MOUNTS-SAE 5 HOLE PATTERN 2.125" BOLT CIRCLE. Products may be stamped KUS or Wema. Wema/KUS SSS 6" sending unit. GAUGE HAS BLACK FACE WITH BLACK BEZEL, IS LIGHTED, AND REQUIRES STANDARD, 2-1/16" MOUNTING HOLE. MANUFACTURER STATES THERE SHOULD BE A 1" CLEARANCE MAINTAINED BETWEEN THE FLOAT RETAINING COLLAR AND THE TANK BOTTOM. Wema S5U 19 " sending unit. Products may be stamped KUS or Wema. 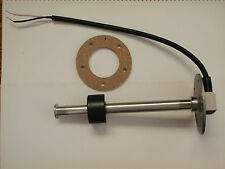 WEMA USA FUEL SENDING UNIT LENTH IS 6". (SH / LOC: 28 A / 9048665). Products may be stamped KUS or Wema. Wema/KUS SSL 26" sending unit. Products may be stamped KUS or Wema. Wema/KUS SSS 4-1/2" sending unit. WEMA USA FUEL SENDING UNIT. 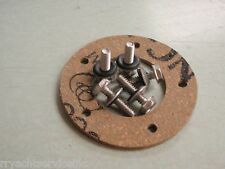 STANDARD MOUNTS-SAE 5 HOLE PATTERN 2.125" BOLT CIRCLE. 240-30 OHMS. Products may be stamped KUS or Wema. WemaS5U 11" sending unit. Wema S5U 14" sending unit. Products may be stamped KUS or Wema. Products may be stamped KUS or Wema. Wema/KUS SSS 9-1/2" sending unit. Products may be stamped KUS or Wema. Wema/KUS SSS 4" sending unit. WATER, GASOLINE, DIESEL FUEL. MANUFACTURER STATES THAT A MINUMUM 1" CLEARANCE MUST BE MAINTAINED BETWEEN THE TANK BOTTOM AND THE FLOAT RETAINING COLLAR. A TANK WITH A 27" DEPTH WOULD REQUIRE A MAXIMUM 26" SENDER. Wema S5U 9" sending unit. Products may be stamped KUS or Wema. MANUFACTURER STATES THAT A 1" MINIMUM CLEARANCE SHOULD BE MAINTAINED BETWEEN THE FLOAT RETAINING COLLAR AND THE TANK BOTTOM. GAUGE HAS WHITE BEZEL WITH WHITE FACE, LIGHTED, AND REQUIRES STANDARD 2-1/16" MOUNTING HOLE. Products may be stamped KUS or Wema. Wema/KUS SSL 23" sending unit. Wema S5U 24" sending unit. Products may be stamped KUS or Wema. 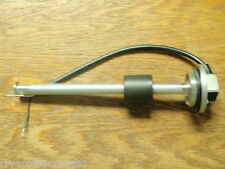 KUS SSL-20 Liquid Level Sensor 20"